The bottle – and the concept – has begun finding its place among the other crystal clear bottles, sporting the label ‘source water’, ‘mineral water’, or even ‘glacier water’. Now to these we have ‘botanical water’ – and we have Dr Bruce Kambouris to thank. The Mildura-based scientist has managed to come up with a way to turn waste water from fruit and vegetable processing into drinking water – a premiup product that is gaining awards and finding its way to exquisite restaurants and shops; more importantly, the technology he’s invented can be used for industrial water usage, responding to one of the world’s biggest challenges: water shortage. “I am a trained chemical engineer, and I also have a PhD in medical sciences,” Dr Kambouris says, as a way of introduction. The seed was sown. But from inception to actually putting an idea into action, it is a different process. This proved to be “extremely difficult.” People loved Dr Kambouris’ idea, but were not very eager to actually invest in it. Finally, Dr Kambouris found a partner in one of the biggest carrot growers in the country – Rocky Lamattina and Sons. “They gave me the opportunity to work in their factory free of charge, to develop the concept at a laboratory level, to develop a commercial application for it. I did all that in their factories and hence offered them a small percentage of the company. It is out of the Lamattina facilities that this new source of water was created, out of discarded fruit and vegetables – the ones deemed ‘too ugly’ to be sold in a supermarket. 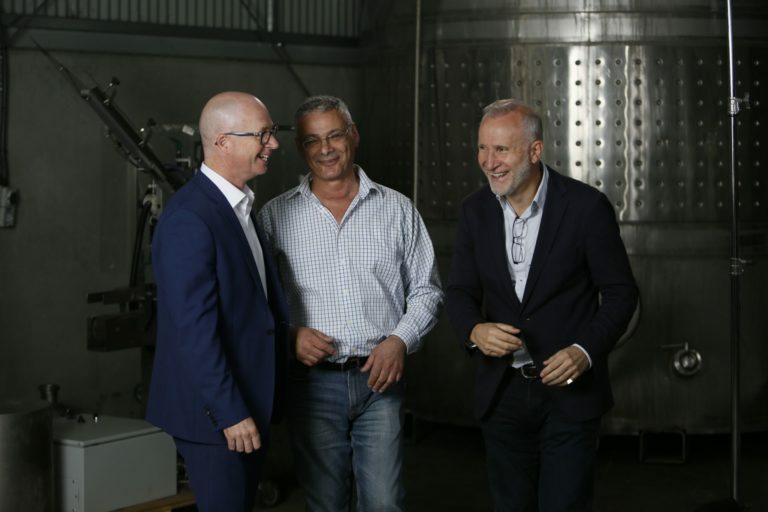 “The other change was that Terry and Spiro Paule, who are the owners, founders and – respectively – Chairman and CEO of the FindexGroup, have entered into my business and in a short time managed to get support from the Woolworths group and we’re about to go nationally with the Aqua Botanical bottled water. They managed to secure general distribution throughout Australia this is about to start in the following weeks. Dr Bruce Kambouris, between his partners, David Driver, left, and Terry Paule, right. To say things are going well for the newly established brand on an international level is an understatement. Success has been documented in a series of International Beverage Innovation Awards that helped made Aqua Botanical known to the global industry. “We won four years back to back in the international arena, awards for ‘best water concept’ or ‘more sustainable water’, so all the big bottlers globally know about this botanical water; this seems to be an accelerating process for this small business that I have established,” Dr Kambouris says. Making premium quality drinking water is one thing, but people need – and use water in almost all daily activity. Particularly in industry, water is used in various operations. Dr Kambouris quickly realised that his method could be really useful to meet the needs of juice factories and sugar mill processsors to become self-sufficient in providing themselves with factory water. “I’m about to go to India,” he says, describing how he got to work with the sugar industry in the country – the second largest sugar producer in the world, but also a country which is the poorest in the world when it comes to water per head of population, the volume of fresh water is critically low and leads to disease and deaths even from children. “They use something like 120 tonnes of water an hour in one factory,” he explains. “You can imagine that the sugar industry is competing with direct use of water versus human existence, human life. This has led the development of the company’s philanthropic arm, Botanical Water Foundation, aiming to give back to the needy of the world, by sharing the know-how and making the equipment that produces free, clean drinking water to communities. “So, we have now started doing pilot studies with equipment in India, with the prospect of 9-12 sugarmills instantly taking on the technology to produce operations water and also drinking water. Australia has been through a water crisis of its own, recently. Dr Kambouris is adamant that his idea of “growing water from vegetables” could benefit both the farming and food processing industry in the country. “This is why I’m attracting the Queensland sugar mills,” he says, explaining that sugar mills produce large quantities of ‘botanical’ water in a very short period of time. “Another option they have is using existing technology that can put all the excess water underground into our aquifers so that we could replenish them, storing this water for the factories, so in the off seasons, where they may want to grow more sugar canes, they can redeem this water from the aquifers. It’s not only companies that are taking to this method, but governments too. “In a short period of time we’ve had the government of Fiji approach us in order to discuss implementing the technology,” Dr Kambouris says. Dr Kambouris says that there has been some interest in the product by Canberra, but only on a consummer level. “The Parliament House in Canberra has ordered Aqua Botanical water, which is great, but I wish they could seriously think of this product,” he says. “It is so important for us. We are a large farming country, we have got lots of sugar mills and we’re very dry. I estimate that we have about 10 billion litres of this water which can be used.